We've reached the final week of the shop. Pizza at Pizzeria Beddia at 115 E. Girard Ave.
For pizza lovers of Philadelphia and of the world, this week will mark a sad day as Fishtown’s famed Pizzeria Beddia closes up shop. In anticipation of the closing, lines outside the establishment have started VERY early to make the cut for the pizza’s 40-pie daily limit. The shop doesn’t open until 5:30 p.m. This past week’s snow hasn’t stopped people from their carb quests, either. With Joe Beddia’s beloved pizza shop entering its final week after three years of booming business ever since Bon Appétit proclaimed his pies the best in all of America, neighbors channeled their heightened emotions to pull together a so-called “pizza rally” to commemorate its passing. It served as decent fodder for people stuck in line all day. “We’re here today because you people are the real heroes, you’re the ones who wait for pizza,” said one of the rally leaders in a video captured by KYW. The demonstration was filled with pizza-themed spoofs of songs, including a lovely Chumbawamba cover. You can attribute the tunes to The Pizza Collection, a band composed of Sam Wachs and Will Dinker, and this seems to be something they've been doing a while… here’s the group's Britney Spears cover entitled, “I’m Not A Girl, Not Yet A Pizza.” Here are an additional 196 pizza songs for you. Just to be clear, though, the band isn't actually affiliated with Pizzeria Beddia in any way. 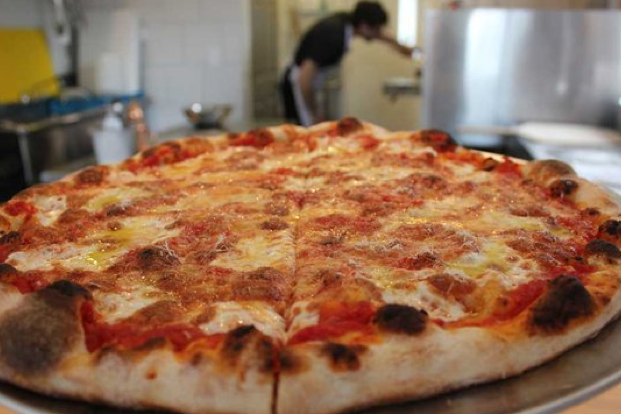 It’ll be sad to say goodbye to Pizzeria Beddia when it closes Saturday, March 31 (especially if you never got to snag a slice), but this isn’t the end of the Fishtown pizza habit. On social media Beddia previously announced plans for a larger space, but it will likely deviate from the original formula (i.e., one man making 40 pizzas a day) and could seat up to 100 people.